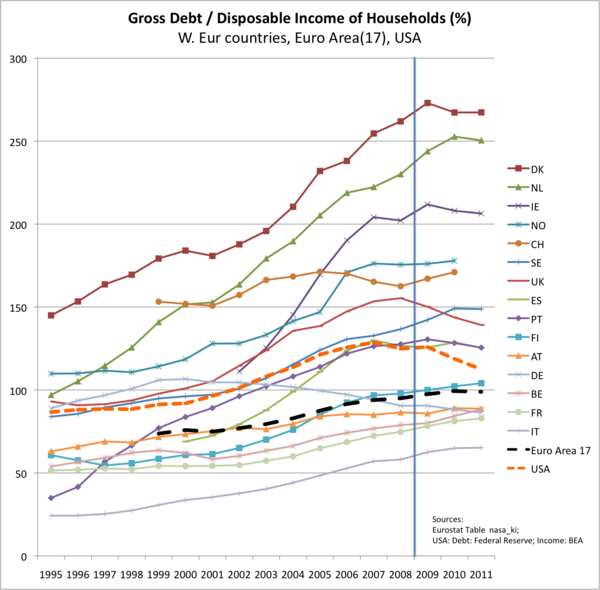 This graph gives the ratio of total household debt divided by the total of disposable income of the households in countries of the Euro Area and the USA. On average the household debt to income rate was relatively stable in the Euro Area approaching the 100 percent just before the credit crisis from around 70 percent at the beginning of the Euro. The household debt to income ratio was already higher in 1999 in the USA and saw a much bigger increase, but unlike in the Euro Area the ratio has come back quite a lot already in the United States. The average of around 100 percent currently in the Euro Area is mainly formed by the bigger economies: Germany and France, who have a ratio close to the Euro Area average. There are notable outliners, especially Denmark, The Netherlands and Ireland that have a way bigger ratio of 200 to almost 300 percent. Debt levels are at crazy levels today, much worse than during the nineties. Australia has a major debt problem that needs to be addressed. But at the moment it’s not even being acknowledged by the mainstream press. The housing sector is doomed. The party is over and everyone knows it. Vendors are taking their overpriced homes off the market and putting them up for rent because they can't even sell! Australian has been running a Ponzi scheme with our assets, our resources and our future? It's unsustainable. Everyone knows auction results have fallen into a black hole (see Auction Results ) and it's got so bad now that even the spruikers can't fudge the figures up above 50%. Melbourne was at 48% last weekend. Dire. The housing market is in severe trouble, no two ways about it. Do you have this information available as a table? or in data points? I am glad to find your impressive way of writing the post. Now it become easy for me to understand and implement the concept. Thanks for sharing the post. Your write-up is incredibly helpful! Reading through your work has educated me. Discovered a lot from it. I will bookmark your blog site and will consistently read through your forthcoming content. Good! Kudos! provide these personal loans.Apply now easily at online and get an instant approval.